by row 3 definition, ravioli is a sandwich. No. This is how holy wars begin. A sandwich is anything between 2 slices of separated bread. Note the key words of slices and separated. Ravioli is just a boiled Uncrustable. I agree. Bread is quintessential. Can’t call something w/o bread a sandwich. Tortillas, waffles or poptarts don’t qualify, and neither would crepes or donuts. I’m torn about kebab bread (pide), whereas dürüm (wrap) is out. I’m open to the debate 1 slice (open faced) vs. 2 slices. I like my sandwiches Chaotic Neutral. What do you call fried chicken between two waffles? 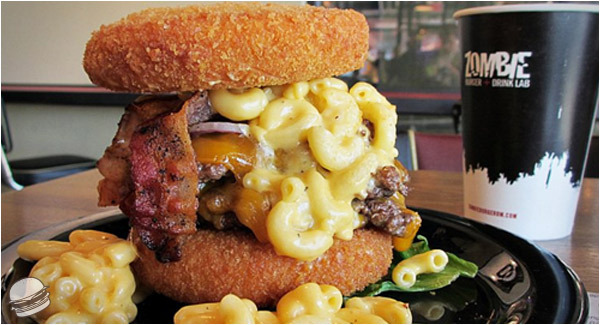 Three patties between buns made of deep-fried mac and cheese? No. An open-face "sandwich" is just meat, potatoes, and gravy with soggy bread. I feel those buns identify as onion rings. 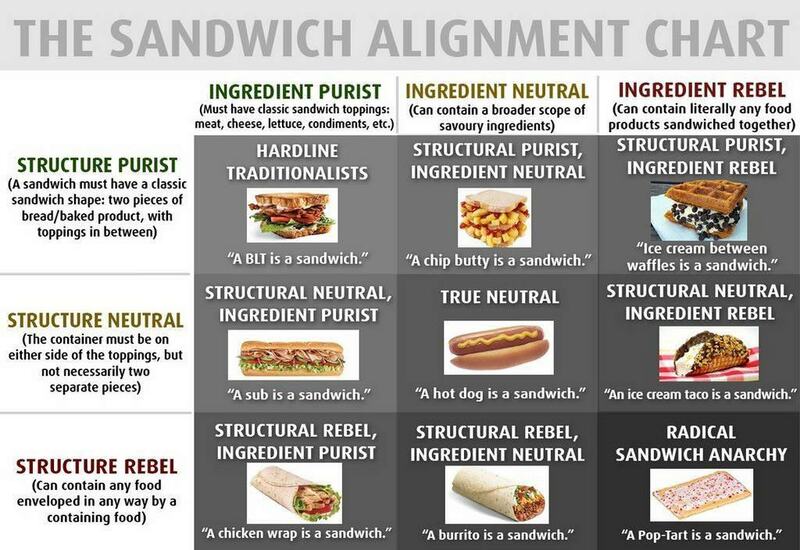 Interestingly, I’m Lawful Neutral in both sandwiches and life. Aside from the afore-mentioned open-face soggy meat and gravy, does the definition of sandwich include being able to pick it up to eat it? 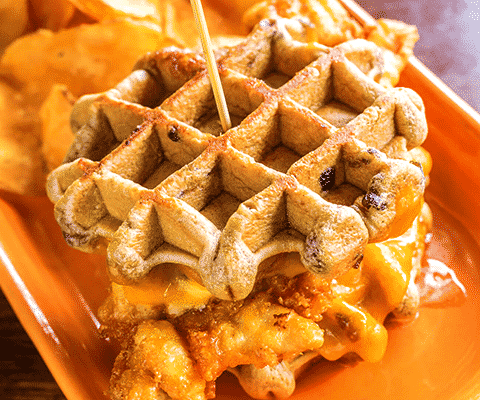 If so, then chicken and waffles doesn't seem like it could apply, never mind the last monstrosity. Why can’t the chicken and waffles be picked up? Assuming syrup on the outside? I’m thinking this is a dipping cup situation. There is also the presumption that you can fit a sandwich in your mouth for a bite, heightwise. Even if I couldn’t stick 3/4 of my fist in my mouth, I don’t see much difference in height profile between this and a standard issue chicken sandwich. But do you cut diagonally or square in half? Even with the aforementioned big mouth, I prefer diagonal, because a pointy shape is easier to shove in. It’s also superior for dipping. I also prefer slices to pieces when it comes to pizza. Always diagonal, easier to eat. On a side note, a pastrami sandwich is best served cold!!! On a side note, a pastrami sandwich is best served cold!!! I mean this in a good way, but I think you may be a space alien. Thanks, perhaps everyone should lists their favorite sandwiches. I'm not sure if I really have a sandwich but a good ole ham and American cheese sandwich on wheat bread with lettuce and tomatoes with mayo is really good. Add to that some Lays potato chips and maybe a side of macaroni salad is good. Classic. Hard to say what my favorite is. PB&J (with a baseball bat) is up there. Maximum preservatives with the peanut butter. Annette Funicello worked as intended, so that’s Skippy. Used to like crunchy, but prefer smooth as I’ve aged. My default meat is roast beef. Fave is Riley’s Roast Beef in Boston, but they’re gone. That was a “homemade Arby’s” type deal, so I just went with BBQ and horseradish sauces. Second place is Potbelly’s before it was a chain, which is gone too. Used to live a few blocks from the original. Standard condiments, no pickle. Got mustard back in the day, but now I get a leeeetle bit of mayo instead. Quite frankly, mayo is disgusting. It’s taken me a long time to warm up to it. My local deli does a sandwich I love. Grilled Halloumi, roasted Portobello mushrooms and Basil pesto with Rocket on a seeded wholemeal baguette. Glorious. I’m in the “can’t stand the texture” group when it comes to mushrooms. Yeah, for some reason, rocket salad is a thing in Europe. I was confused the first time I ordered carpaccio in mainland Europe, and it was advertised as “with rocket salad”. Bitter greens were never something I understood. They taste like dirt to me. I never had a thing for arugula but a couple of years ago we did a CSA and the arugula they gave us was AMAZING. Peppery, flavorful. I tried buying some from the store the next week and couldn't stand it. No idea what they had but it was great.